When choosing a baby blanket, there are several things you need to consider including style, safe materials and size. We’ve rounded up a few of our favorite picks. Baby Blankets are considered one of the top ‘must-haves’ when it comes to baby necessities, but choosing the best one for your tot is no easy feat. Things to consider when purchasing a baby blanket include softness, breathability, safe materials, durability and style. You can never have too many blankets as there are so many uses for them – be it for security or for sleeping. We chose 11 of our favorite baby blankets to wrap your little tot in, keeping her safe, comfy, warm and stylish at all times! 1212 Receiving Blanket- Grey: Wrapping your baby up in the 1212 Receiving Blanket is like giving them a big, love-filled cuddle. This double-layered blanket is made from 100% organic Peruvian pima cotton and is sure to keep your tot comfy, cozy and warm all day long. Features square corners with a top-stitch edge. Size 35”x35”. 1212 Receiving Blanket – Bars Print: We love the simple, sophisticated and monochrome design of the 1212 Bars Print Blanket. In its signature double-layered softness, your little tot will not only be super snuggly and warm but will also look totally chic. Made with 100% organic Peruvian pima cotton with square corners and a top-stitch edge. Size 35”x35”. Little Unicorn Organic Cotton Muslin Quilt: The breathable and lightweight Little Unicorn Quilt will keep your baby staying cool when it’s warm outside while also ensuring he is warm enough during the cold months. The 4 layers of organic cotton muslin regulates baby’s temperature and keeps him cozy and comfortable. We love the two gorgeous print choices of Watercolor Rose or Forest Friends. Size 47” x 47”. 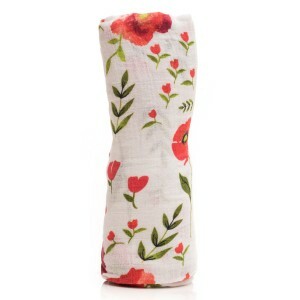 earth baby OUTFITTERS – Organic Cotton Muslin Swaddle Blanket: Earth Baby Outfitters’ swaddle receiving blanket will be your go-to for everything! Light-weight , breathable and folds up small to fit diaper bags for on-the-go use. Not only is it the ideal blanket for bringing baby home, and of course swaddling, but your little one will still love it as they grow into toddler-hood. 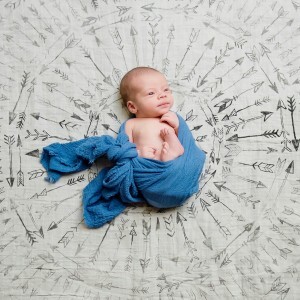 Generously sized at 47″x 47″ and made of 100% GOTS Certified Organic Cotton, this versatile EBO swaddle blanket makes for a beautiful yet practical gift for new mothers. The print is non-toxic, using only water based eco-friendly dyes, making it perfect for babys’ sensitive skin. It’s pre-washed (without chemicals or softeners) and quilted so it is extremely soft and perfect for swaddling. Packaged in a cute panda 6.5″ x 11” kraft box with cotton rope handle. Under the Nile – Swaddle Blanket 2 Pack Nature’s Nursery: These beautiful swaddle blankets from Under the Nile are created with 100% handpicked organic Egyptian cotton. Created at a fair trade farm in Egypt, no chemicals or pesticides are used throughout the entire cultivation and production process. 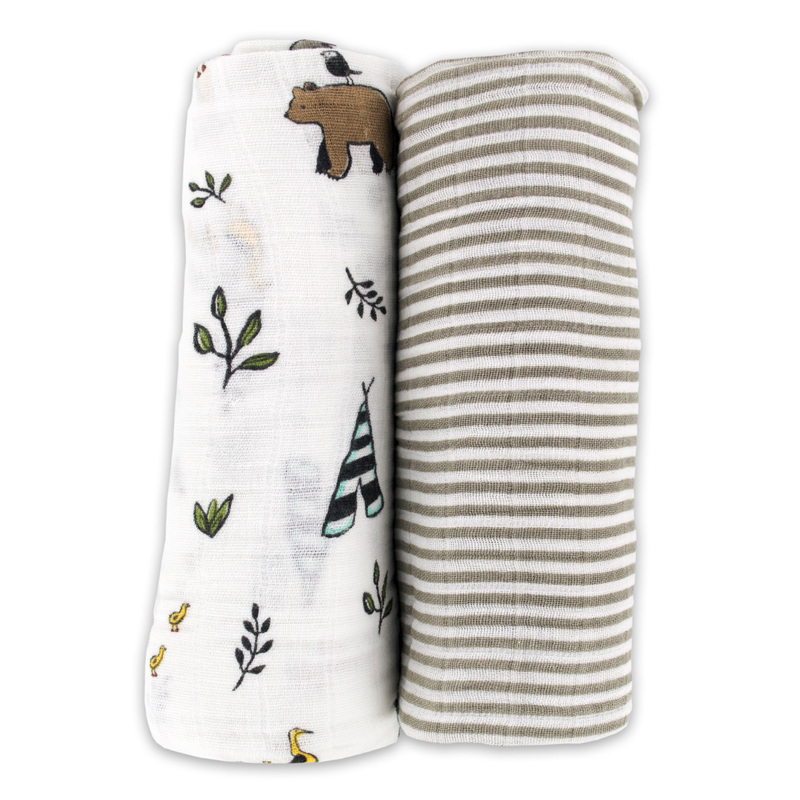 This 2-pack of flannel swaddle blankets is perfect for swaddling, covering, and snuggling. Perfect weight for all year round. Nature’s nursery set includes one animal print and one stripe blanket. Petit Pehr – Playtime Blanket – Hi: We just adore the pops of color in this adorable double-sided blanket. 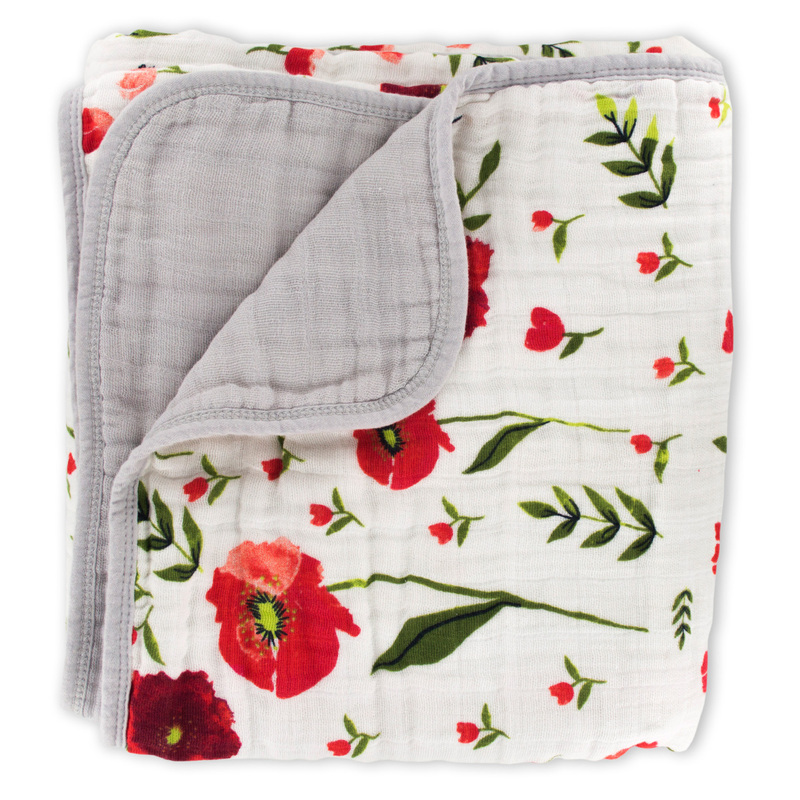 This Petit Pehr ‘Hi’ blanket is made from 100% quilted cotton, is 36L” x 36W” and is the perfect playmate or stroller blanket. Petite Vignone Dream Bedding Set: Surround your baby’s crib with warmth and luxury with the plush Petite Vignone Dream Bedding Set. This 500-thread-count Peruvian Cotton bedding set features a Cotton Quilt Comforter that is super soft against baby’s skin. Decorated with delicate embroidery for a charmingly elegant finish, the Cotton Quilt Comforter comes in size 28” x 52”. The bedding set also includes a Fitted Sheet, Decorative Pillow Sham, Crib Sheet Protector and Decorative Pillow. Little Unicorn – Organic Cotton Muslin Swaddle Set, 2 pack: You can never have enough baby blankets! Stock up with the Little Unicorn Organic Swaddle Set. Comes in a set of two of their lightweight, breathable and versatile design that will give you even more reason to snuggle and cuddle with your baby. Made of 100% organic cotton muslin, they get softer and softer with every wash. Size 47” x 47”.